Welcome our representative on arrival at Yangon international airport and transfer to the hotel. After a brief fresh up at hotel, begins the orientation tour of Yangon, includes Sule Pagoda, the City Hall & Colonial buildings, Chaukhtatkyi Pagoda, photo stop at Karaweik Hall & Royal Barge on the Kandawgyi Royal Lake. At sunset, visit the marvellous Shwedagon Pagoda, the glistening golden stupa that towers over the capital and one of the wonders of the world, is the spiritual centre of the country. Overnight at hotel in Yangon. After breakfast at hotel, transfer to airport for the flight to Bagan, one of the richest archaelogrical sites in Asia. 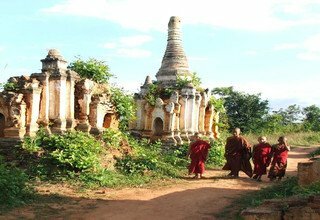 Tour sites included Shwezigon Pagoda, Ananda Temple, Gubyaukgyi Temple, Dhammayangyi and Sulamani Temple.Late afternoon, visit Shwe San Daw Pagoda which you can watch a beautiful sunse. Overnight at hotel in Bagan. After breakfast at hotel, visit Mt. Popo about 50 km south east of Bagan is 1520 meters high. It is said to be the core of an extinct volcano. 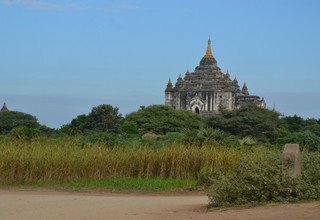 Return to Bagan, visit Tayokpye, Htilominlo and Thatbyinnyu Temple before sunset.Evening enjoy Bagan’s most popular sunset at Bu Paya overlooking view to Ayeyarwaddy River. Overnight at hotel in Bagan. After breakfast at hotel, transfer to the airport for the flight to Mandalay, second largest city of Myanmar. 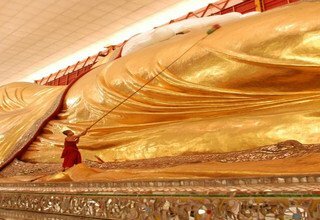 Visit to Mahagandayon monastery, Shwenandaw monastery, Kuthodaw Pagoda and Mahamuni Pagoda. At sunset, walk along the long bridge Teak U Bain (on Taungtaman lake) to admire a beautiful sunset over the lake.Overnight at hotel in Mandalay. After breakfast at hotel, transfer to pier for the boat ride to Mingun, 11 km up river from Mandalay on the western bank of the Ayeyarwaddy River. 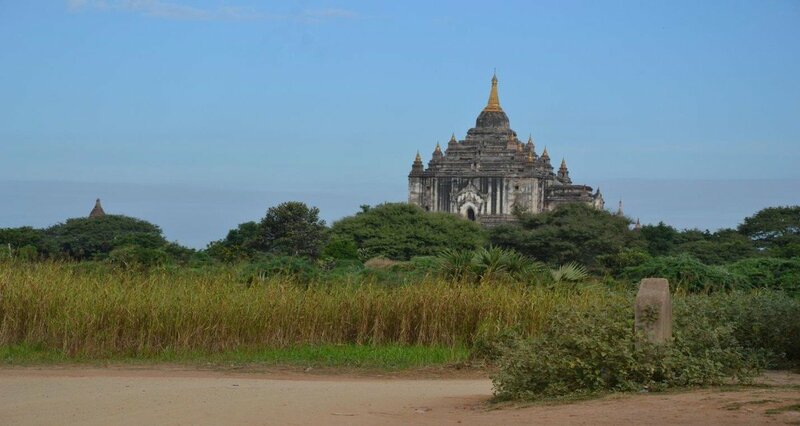 Visit a huge unfinished pagoda (Pa Hto Taw Gyi), Myatheindan Pagoda and Great Mingun Bell. Then sail back to Mandalay. In the afternoon, visit to colorful Zegyo Market strolling around, silk weaving, gold leaf making workshop.Enjoy the sunset from Mandalay Hill and enjoy the panoramic view of the plain. Overnight at hotel in Mandalay. After breakfast at hotel, visit to Pyin Oo Lwin, 1070 meters above sea level, is 67 km east from Mandalay. Visits Mahaanthtookantar Pagoda, Kandawgyi Garden (Botanical gardens), Market and Pwe Kauk waterfalls. Return to Mandalay and overnight at hotel in Mandalay. After breakfast at hotel, you will be transferred to airport for the flight to Heho. Arrive Heho, proceed to Pindaya and visit the Pindaya cave and paper factor. Overnight at hotel in Pindaya. 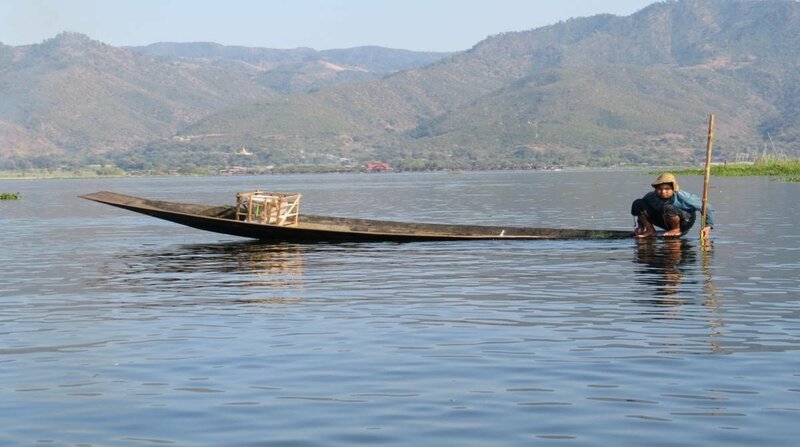 This morning after breakfast, drive to Nyaung Shwe said “the door of Inle Lake”. 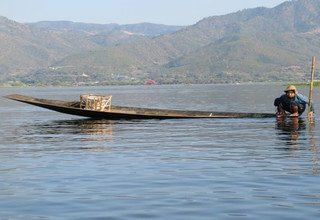 Arrive Nyaung Shwe, start boat excursion on Inle Lake - Phaung Daw U Kyaung, Nga Phe Chaung Monastery, gold and silver smith workshops, shan shoulder bag weaving center and floating garden. Enjoy the sunset while visiting the lake by boat. Overnight at hotel in Nyaung Shwe. After breakfast at hotel, visit to Indein village, which is surrounded on both sides by high hills.After a short distance walk through the bamboo forest , the exciting vie Indein Temple complex is situated in the western shore of the lake and most of the internal wall of the ruins of 1054 shrines make you say “wow”. In the afternoon, visit Impawkhone silk weaving village, a blacksmith, Cheroot making and surrounding villages. Overnight at hotel in Nyaung Shwe. Breakfast at hotel, free you leisure time till you will be transferred to airport for the flight to Yangon. Arrive Yangon, visit Bogyoke Aung San Market (Scott) which has an enormous array of consumer goods and has the largest collections of souvenirs from all over Myanmar. After shopping, proceed to China Town and walk around in the area. This late afternoon, you can stroll along the Yangon River to end up the day. Overnight at hotel in Yangon. Breakfast at the Hotel, enjoy a leisurely morning and You will be transferred back to the airport for your flight back home.